It really gives me great pleasure to come again to officiate at the opening of the AYO Rehearsal Camp. Keith Lau (General Manager of AYO) has thanked me and Jim also thanked me for my long-time support for AYO, but my support for AYO did not date back to 28 years ago. I'm still pretty young. But I have been in this position, coming here to open the Rehearsal Camp, since 2013, so this is indeed my sixth attendance at the AYO Rehearsal Camp. But this is also a first time. I'm coming here the first time as the Honorary Patron of AYO - not the first time as the Chief Executive because I was already here last July in my position as the Chief Executive, but since then I received an invitation to take up the position of AYO's Honorary Patron and I readily accepted. So this year is my first attendance as your Honorary Patron. There are several reasons I want to come this year. One is really to thank AYO for last year's world tour. 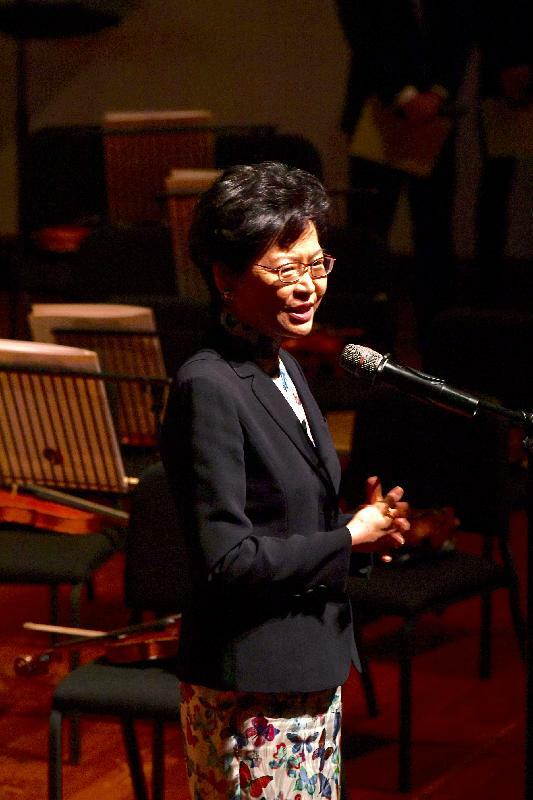 Last year's world tour was part of the Hong Kong SAR Government's celebration of the 20th anniversary of the establishment of the Hong Kong Special Administrative Region. 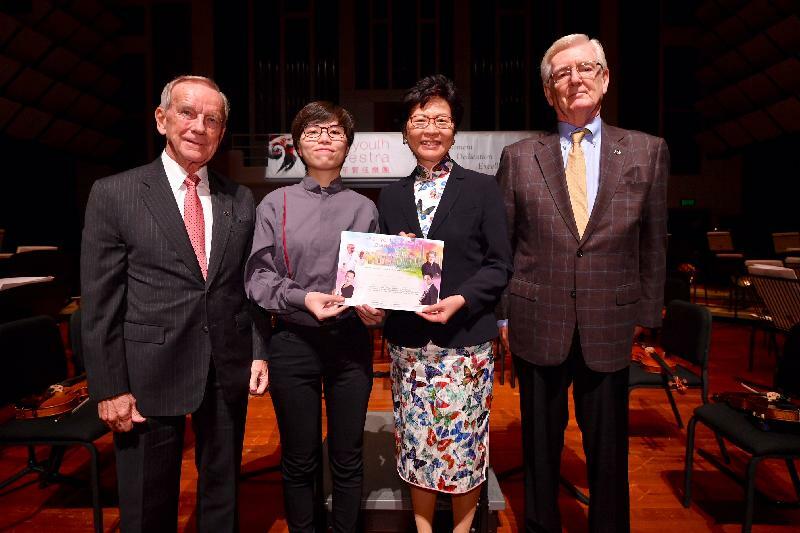 When I was still in the Government as the Chief Secretary for Administration, I thought what a wonderful occasion for us to showcase young musicians in the AYO and also for us to demonstrate the powerfulness of friendship in the Asian region to the world, because Hong Kong is Asia's world city. This is a wonderful place to have this AYO initiative. So last year, with our sponsorship and Cathay's sponsorship, AYO was able to tour the world, going to places that have not been toured previously including wonderful places like Vienna and places which I don't understand why you go, that is Toulouse in France, which is very famous for aircraft. I didn't realise they have also a very nice concert hall that you could perform. So I want to give you a brief summary of the evaluation report submitted to me about our collaboration with AYO last year. These world tour performances have really made us very proud, because they were widely reported in the local newspapers wherever you travelled to and performed, and the average attendance in all these world tour concerts was 85 per cent. But actually, for many of the performances, the attendance was 100 per cent. It was a result of the arithmetic as there was one occasion that the attendance was 60 per cent. It's nothing to do with AYO musicians - must be something to do with the venue. But otherwise I was so delighted to realise that it was 100 per cent in Beijing, it was 100 per cent in American cities and so on. It was very well attended with a very good response even at the very professional level. It's not only just because a bunch of young people coming they gave you a good response, but they gave you a very good professional appraisal of the very high standards of this youth orchestra. And I also want to thank Keith because in the evaluation report there's always this financial section. The financial section said something like this: Thanks to the prudence of AYO in managing expenditure, and in negotiating hard for lower fees, ultimately the government sponsorship for this AYO tour was 20 per cent less than the budget. Unfortunately, the Government rules and regulation are such that one project is one project, so I can’t sign off a cheque of several million dollars that I have saved to AYO. You have to apply again if you want another government sponsorship. 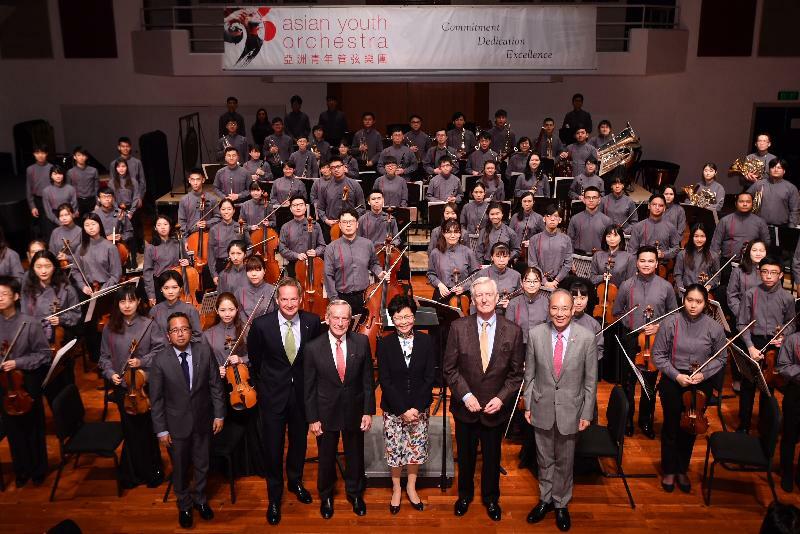 So much for the 2017 world tour of AYO, which I am extremely grateful, because after your tour Hong Kong will be perceived not only as a financial centre, but really as a city with very talented young musicians being brought together from different parts of Asia. Now, coming back to this year's tour, it is also very unique because it's the first time that I read from the brochure that there's this Guangdong-Hong Kong-Macao Bay Area. This is now such a topical issue in Hong Kong - this is a bay area economy like the Tokyo Bay, San Francisco Bay, and the New York metropolitan area. AYO really catches up with the government work, so there is a tour to three Bay Area cities including Hong Kong, Zhongshan and Guangzhou. I want again to thank AYO for giving this added value to the AYO's tour with the inclusion of some of the cities in the Bay Area. There's also a further reason that I've come, which is to thank AYO for supporting my first official visit to Japan in my capacity as the Chief Executive later this year. This is the biggest official visit of the Chief Executive in 2018. Although I've been to Europe in June, actually the destination with the biggest delegation for this year is Tokyo in Japan. Together with the Hong Kong Trade Development Council, we'll be organising a lot of "Think Global, Think Hong Kong" promotion activities, conferences, gala dinners and so on. I suddenly had this idea - because if you read the history of AYO there is a very strong Hong Kong-Japan collaboration - if we could bring part of AYO to Japan during my official visit that would be a wonderful thing. Richard Pontzious has always been very forthcoming and supportive of the Government's initiatives so I can announce here that during our official visit to Tokyo later this year, and of course with the strong support of Ambassador Matsuda, AYO will do two things for us. About eight AYO musicians from Hong Kong will perform at the gala dinner attended by very important business people in Japan, and on top of that AYO will do a concert in Japan, in Tokyo, bringing together around 30 alumni musicians who have been with AYO previously. They are brought together and these Hong Kong musicians and Japanese musicians with very close bond and friendship will perform for us while we are doing our business promotion in Tokyo. That is a wonderful idea, resembling the spirit of AYO, and also tells this year's participants that if you do well, we'll bring you back as alumni for future performances. With those remarks, I wish you a wonderful Rehearsal Camp and a very successful tour this year. Thank you very much.